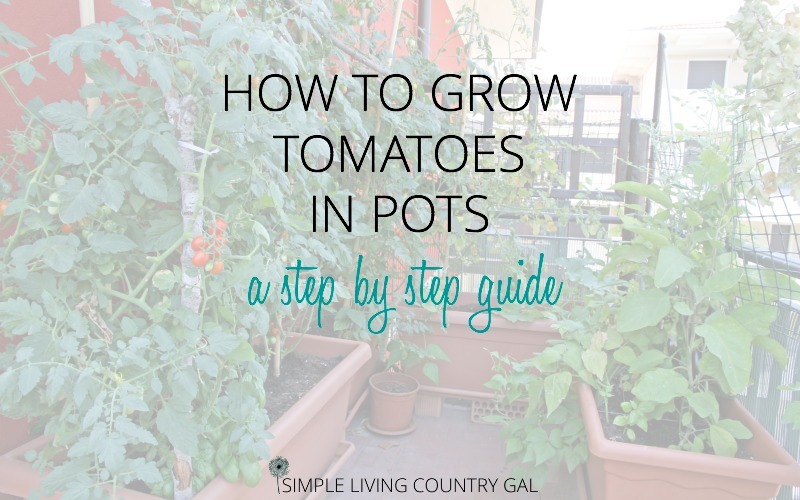 This post will teach you just how to grow tomatoes in pots! One of my favorite parts of homesteading is growing food for my family. To take a seed from a little paper packet, plant it in some ground and a few months later I have a bountiful harvest is something I look forward to every year. Unfortunately the last few years have not been good and this year I am forced to do something drastic. My soil has become invaded with just about every garden pest in our area. And to add insult to injury we also got it with some pretty nasty diseases as well. I have tried to fix things on my own but I realize now it is going to take a bit longer than an offseason to fix things. This year instead of planting in my garden I am moving things on up to the house. Yep, this year I am going to have a patio garden and I am pretty excited to see how it goes. I have always grown a few things on my patio. Flowers, herbs, and every now a planter of lettuce. My full garden is quite a ways from the house so it is nice to have a few things close by for meals. This year, however, I am pulling out all the stops. I plan to grow my entire garden up by the house using any container I can get my hands on. I hope to let my garden sit vacantly and let the chickens dig it up the best they can. It was suggested to me by a local master gardener to let my garden sit dormant for 1-3 growing seasons (yep, you read that right) so I was desperate for a plan B.
I spent the last month researching all I can about growing vegetables in containers and this is the first in a long series. Each time I will focus on a different veggie and as I learn you will learn so we can grow together. 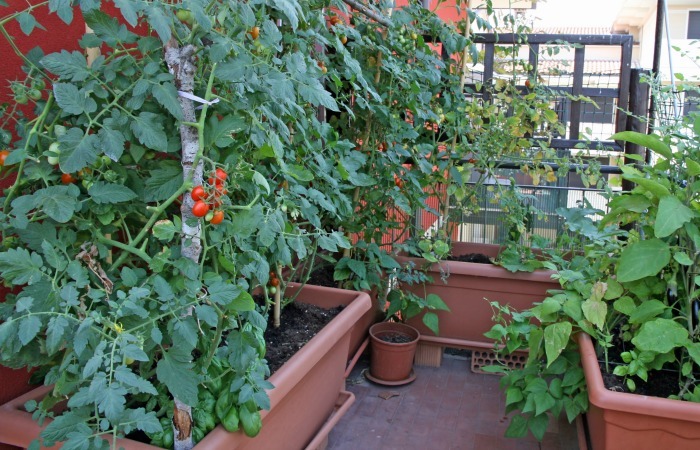 How to Grow Tomatoes in Pots – A Few Things to Remember. When growing your garden in containers there are really no rules. You can pretty much use anything you have as long as you follow a few guidelines. Make sure you have ample drainage. – If not you can simply drill a few holes in the bottom of whatever container you choose. Make sure your plants have enough room to grow. – The key to strong and healthy plants is enough room for a sturdy root system. Plenty of room and plenty of drainage are your first steps when growing tomatoes in pots. As long as you have those two things you are well on your way to a summer full of BLT’s and homemade sauce! When folks think of how to grow tomatoes in pots they immediately go to cherry tomatoes and rightfully so. This is the perfect plant to grow close to the house so you can grab a yummy snack all summer long. Step #2 Planting – Keep it to one plant per pot. Don’t be tempted to put more than one plant in a pot. Overcrowding can lead to poor air circulation which can lead to diseases such as early blight. Step #3 Soil – When planting use a good quality soil (allow for 1 inch of space from the pot rim) and compost mixture. As flowers start to appear add some more compost to your container by just sprinkling it around the plant directly in the pot. As you water the nutrients will slowly work it’s way down to the plant’s roots making absorption easier. Yes, it is possible to grow full sized tomato plants in containers! How cool is that? Before we dive in deeper we need to go over a few terms. There are two types of tomato plants Determinate and Indeterminate. Determinate tomato plants reach a certain plant height and then stop growing. The majority of their fruit matures within a month or two and appears at the ends of the branches. These tomato plants need to be supported by a cage and are a favorite of canners since all the tomatoes tend to ripen at once. Indeterminate tomato plants are vine-like plants. They continue to grow and produce fruit all season long. It is not unusual to have indeterminate plants reaching 15 feet or even more so a support of at least 5 feet is a must. 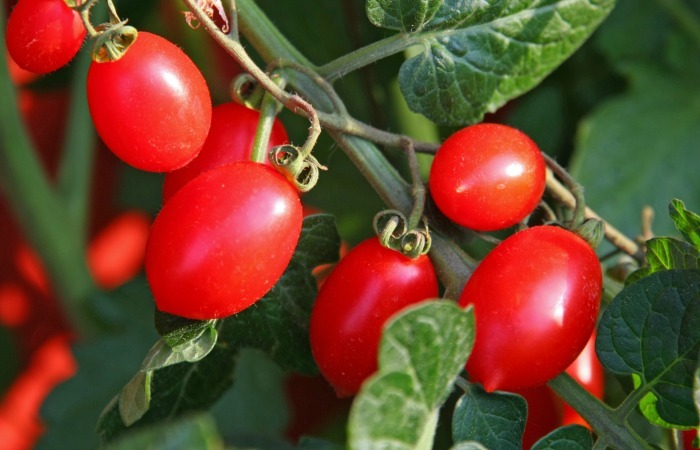 The biggest advantage to these plants is you will get fruit all season long which is perfect for eating and enjoying. When choosing a plant for your pots it is best to stick with a bush-like Determinate plant. Step#1 Pot size – This is important when growing tomatoes you need to make sure your plants have enough room to establish a sturdy root system. Choose a pot size that is at least 18-inches in diameter. A good choice is a 5 or 10-gallon bucket. Step#2 Drainage – As mentioned above be sure to drill holes in your containers for ample drainage. Step#3 Location – Choose a spot that gets at least 6 hours of sun. You can group your plants together for easier care but do not let the plants touch. Step#4 Location part 2 – Potted tomato plants require a steady amount of water so if possible locate your planters close to a water supply. Step#5 Support – Ad your support such as a tomato cage right away. Doing so later risks disturbing the root system and/or damaging the plant. Step#6 Planting – Remember to dig a hole deep enough that it will cover ⅔ of the stem. This will help to encourage more root growth and result in a more sturdy plant. Step#7 Mulch – Even though you are using pots it is still important to include a good layer of mulch. For this reason, you want to make sure you leave a good 1-2 inches of space below the rim of the pot. Using mulch will keep your soil moist longer so make sure to replace with fresh mulch as the mulch compresses during the growing season. Bark, straw, leaves, or shredded newspaper are all good options for mulch. Step#8 Soil – Make sure to use the best soil for the best plants. This is an important step so no scrimping here. Choose a light and fluffy potting soil that will not compact down. Please note when using a fluffy soil that it may rest down and you will want to add more soil later on. Step#9 Water – Adding enough water is the secret sauce to a healthy harvest. One of the drawbacks of growing your tomatoes in pots is you will need to water more often. Unfortunately, there is a fine line between enough water and too much. To be sure you are giving the right amount use the high tech finger test. Simply stick your finger down into the soil and if the top 1 inch or so is dry, it’s time to give your plant a drink. Bottom line. Watering is the key to a healthy strong and abundant tomato plant. You want to keep the soil in your pots consistently moist – not wet, but damp. Get your FREE watering guide to ensure you are always giving the correct amount at the most crucial time. You can find this post and others at my favorite Blog Hop! !